Once you have placed an order, a member of Team BearHugs will prepare your item with lots of love and care, ready for dispatch within 1 working day. If you'd like your item sent directly to a loved one, please provide their address as the 'shipping address' at checkout. If you'd like to add a message to your order, please send this by email to hello@bearhugsgifts.com with your order number as the subject line. Europe (Royal Mail International Tracked): Within 10 days. Faye, 27, from Sheffield, is very happy to call herself 'Chief Sender of Hugs' at her social enterprise, BearHugs, which launched with the support of the Prince's Trust in 2015. Before starting BearHugs, Faye trained to be a Speech and Language Therapist and started work on the Isle of Lewis in the Outer Hebrides. After falling seriously ill with Lyme Disease, Faye had to resign. When unable to leave the house, she received an especially thoughtful package through the post from a friend and it totally brightened her day.The idea for BearHugs was born. Faye turned to The Prince’s Trust and, with our support, was successfully able to turn her little idea to 'send hugs through the post' into a reality through the Enterprise programme. In her first two years, Faye sent over 5000 'hug in a box' gift hampers, hired three members of staff, offering part-time, flexible, remote opportunities to people living with chronic health conditions. BearHugs has also forged a philanthropic partnership with the charity Post Pals, donating a gift to a seriously ill child for every 50 gift boxes sold. BearHugs has won a number of awards including the Duke of York Young Entrepreneur Award, Univeristy of Sheffield Startup Award and Prince's Trust NatWest Enterprise Award. Faye is now proud to be a Prince's Trust Young Ambassador and regularly shares her experiences of the Enterprise Programme with others. BearHugs offers a range of 'hug in a box' gift hampers which can be ordered online, personalised and sent directly to the doorstep of a loved. 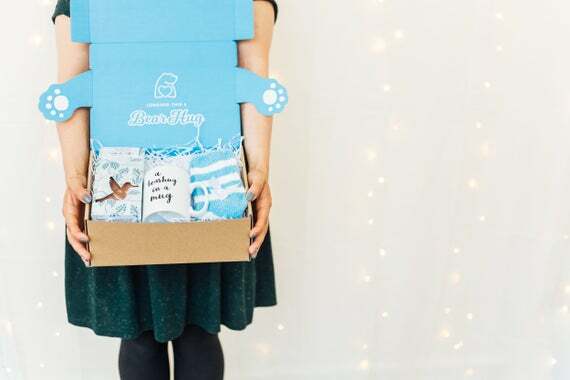 Every BearHugs gift box is filled with comforting, uplifting UK-made treats and reveals two outstretched paws on openining. Whether it's Thinking of You, Get Well Soon, Happy Birthday or Just Because, sometimes nothing says it better than a hug.